Demand for Ardnamurchan distillery’s first release has massively outstripped supply – even though the spirit is too young to be called whisky. The remote west coast distillery, owned by independent bottler Adelphi, is releasing 2,500 bottles of Ardnamurchan Spirit 2016 AD, a vatting of immature peated and unpeated spirit filled into cask in June 2015 and October 2014. Spirit must mature for at least three years before it can be labelled as ‘whisky’. But pre-orders for the new liquid have exceeded 7,500 bottles, with Danish whisky distributor FC Whisky estimating that it could have sold 800 bottles in Denmark alone. ‘Demand has been wild,’ said FC Whisky’s Claus Fisker. ‘Prior to a launch we contact our UK and international agents and distributors to gauge interest and take pre-orders,’ said Adelphi and Ardnamurchan MD Alex Bruce. 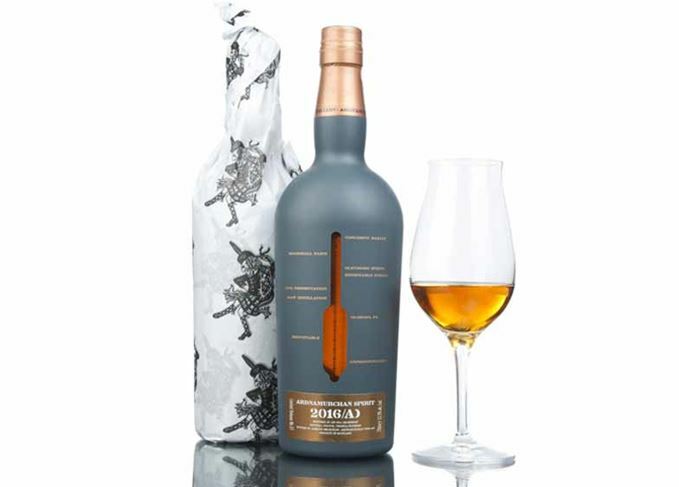 Ardnamurchan Spirit 2016 AD (the ‘AD’ stands both for Ardnamurchan Distillery and Anno Domini) is a vatting of 29 ex-oloroso and Pedro Ximénez Sherry octaves (55 litres each), filled with peated and unpeated spirit in June 2015 and October 2014 respectively. The spirit then spent an additional three months marrying in 500-litre ex-Pedro Ximénez Sherry butts. The bottle, created by Edinburgh-based Nevis Design, is coated in ‘ash/moine’ (slate grey) to mark the volcanic past of the Ardnamurchan peninsula, featuring a hydrometer-shaped window to highlight the colour of the spirit. Copper lettering refers to the spirit’s production: barley grown on Broomhall Farm in Fife, next to the company’s bottling facility, the use of 100% renewable energy sources, and Sherry casks for maturation. Bottled at 53% abv, Ardnamurchan Spirit 2016 AD has a UK RRP of £47.50. The Adelphi MD talks blockchains, transparency and forgotten queens conceived in fireplaces.